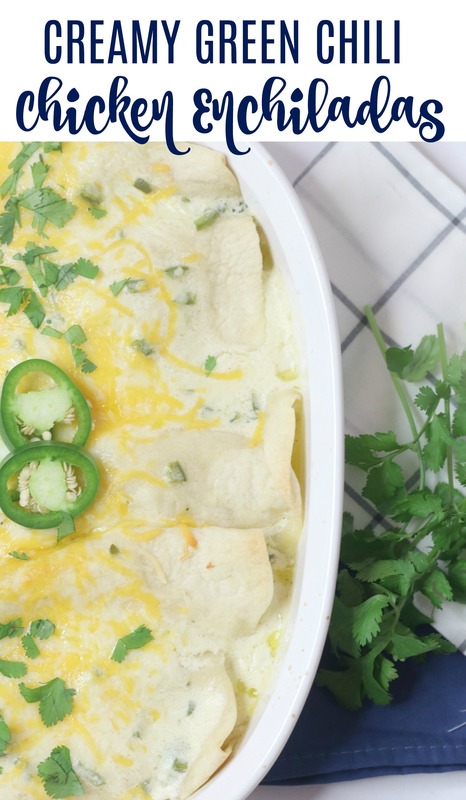 These creamy green chili chicken enchiladas are delicious and one of our favorites! 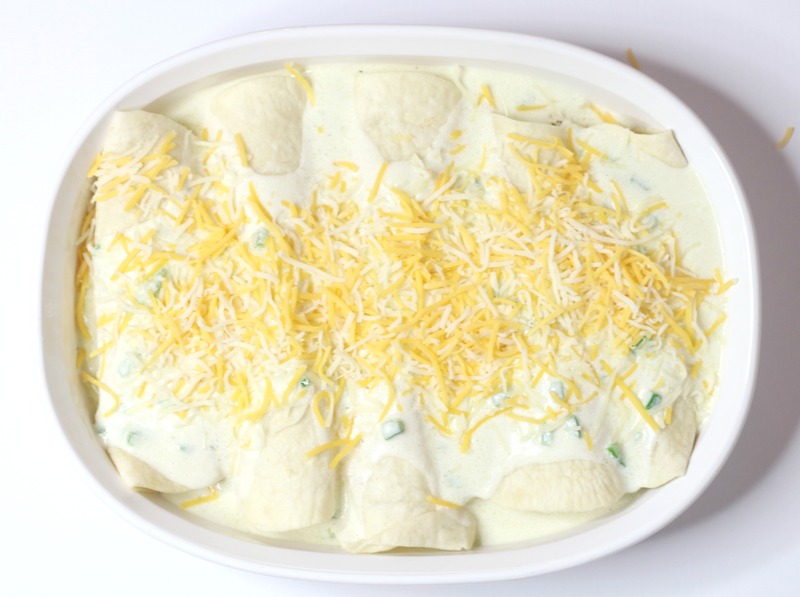 Flour tortillas filled with chicken, sour cream, cheese green chilies and topped with more cream sauce and cheese! 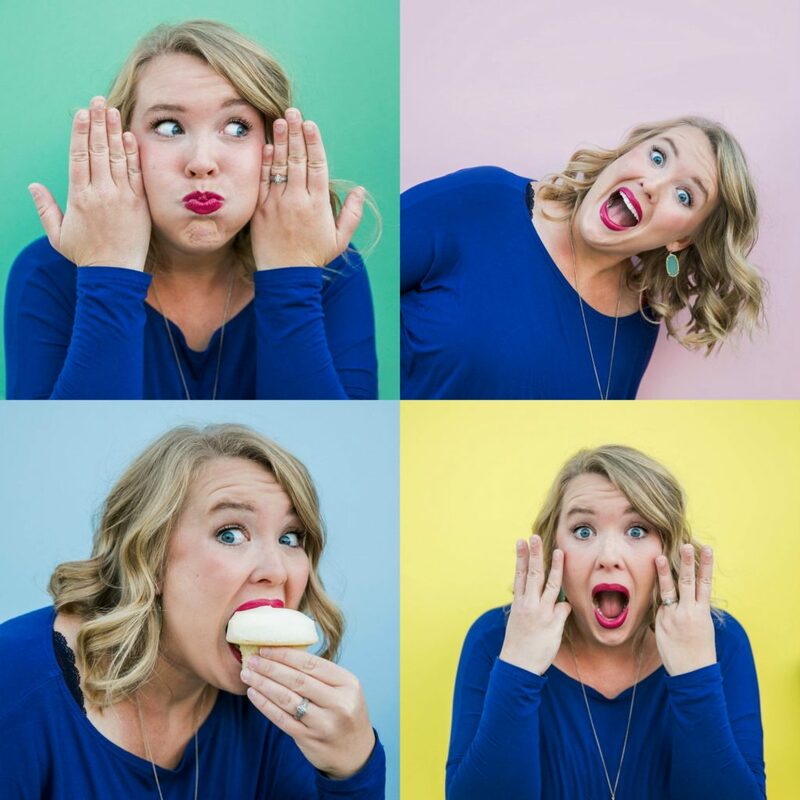 As you know, we LOVE enchiladas in our family! 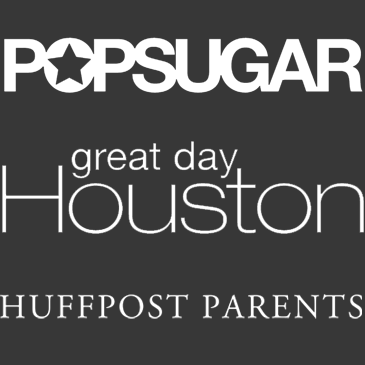 We live in Texas and you can find the best Mexican food ever in our city. With all of the delicious Tex-mex we have eaten, I knew I had to start making some of this deliciousness at home. I typically make at least 1, maybe 2 different kinds of Mexican dishes per week. These Authentic Beef and Cheese Enchiladas and this Mexican Chicken Soup with Avocado along with the chicken enchiladas are always on rotation. I love to make these enchiladas when we are feeding a large group of people, they are delicious and always a hit. It is also super easy to make enchiladas in bulk! I made these enchiladas with flour tortillas but have made them with corn as well. Either way, they are delicious! To get started, you have to make your roux. A rough is melted butter with a little bit a flour added and stirred until golden brown. After you have your roux, slowly add your chicken broth until all is combined and smooth. Once thick slowly add in sour cream, green chilies and jalapeno. Cover bottom of baking dish with creamy sauce. In a large bowl add chicken and cheese. Fill each tortilla with chicken mixture, roll and place seam side down in baking dish. Cover enchiladas with more sauce and sprinkle with cheese. Bake at 350 for 20 min or until cheese is bubbly and brown. Yes! 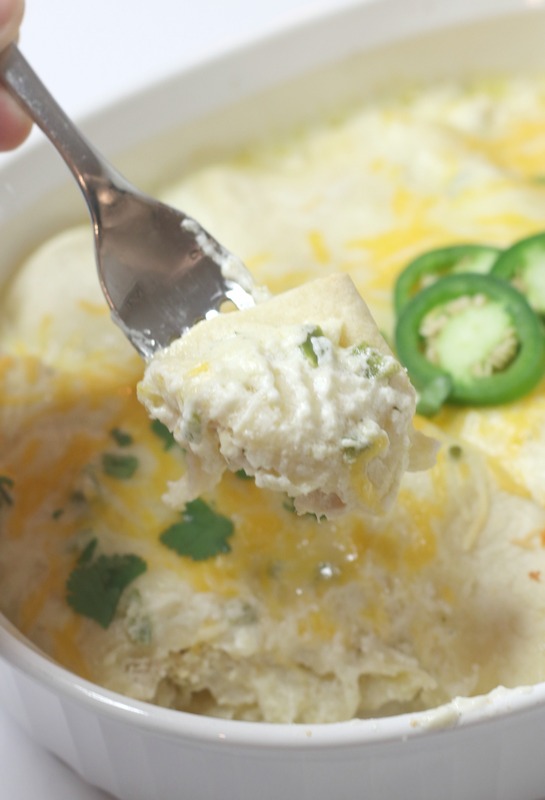 You can freeze enchiladas. Just make sure that before you bake them, you let them thaw completely. Also, I would wait to add cheese on top until right before you pop it in the oven. Just makes it taste fresher. CAN YOU MAKE ENCHILADAS AHEAD OF TIME? Yes, you can! 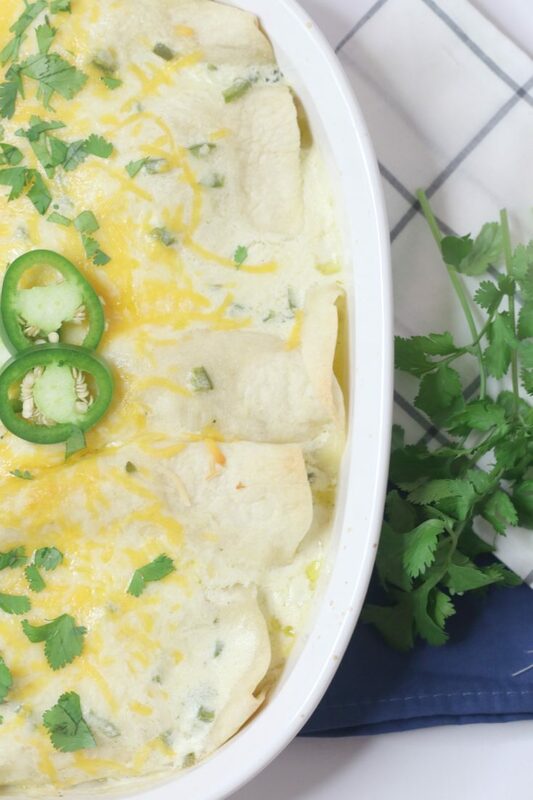 You can definitely make enchiladas ahead of time. I would suggest that if you are using flour tortillas that you not pour sauce over the top until you are about to put it in the oven. You can fold them and put them in the dish and have the sauce waiting on the side. This will ensure that they do not get soggy. If you are using corn tortillas fill free to complete all of the steps, freeze or put in fridge until ready to bake. Fill your tortilla with a large spoon full of whatever filling you choose. Fold over each side of the tortilla tightly and place seam side down in the baking dish. 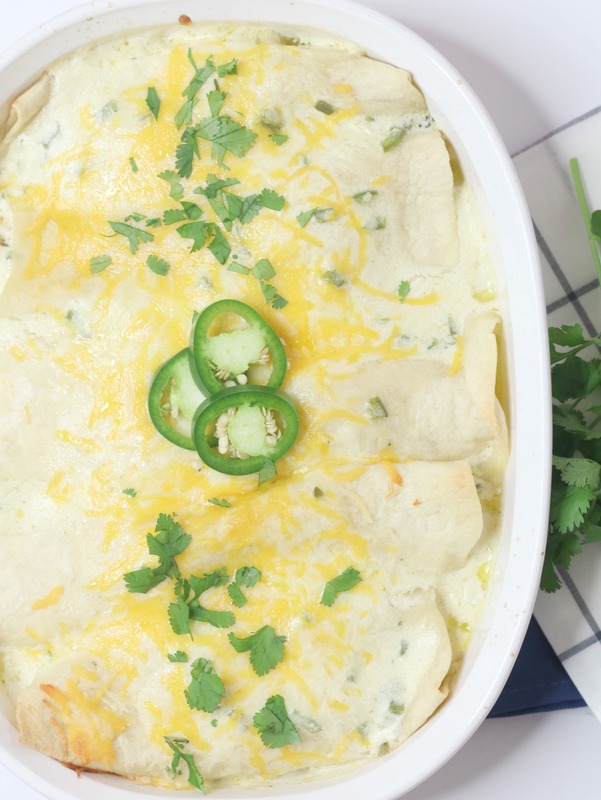 These enchiladas are amazing and are a guaranteed hit! This is a great quick and easy dinner option and one that will definitely become a favorite in your home as well. 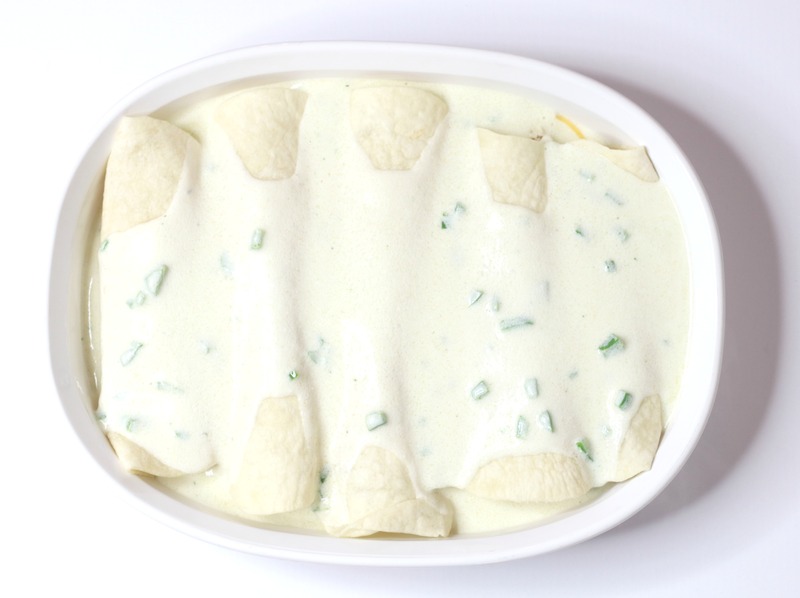 These creamy green chili chicken enchiladas are delicious and one of our favorites!Flour tortillas filled with chicken, sour cream, cheese green chilies and topped with more cream sauce and cheese! Melt butter into sauce pan on medium heat. Once melted, whisk in flour until golden brown. Slowly add chicken broth. Let simmer and whisk until smooth and creamy. Turn heat to low and add sour cream, cubed cream cheese, green chilies and jalapeno. In a mixing bowl, combine shredded chicken and 1 cup of shredded cheese. Roll enchiladas! Fill each tortillas with chicken mixture, roll and place seam side down into baking dish. Pour creamy mixture over enchiladas making sure they are well covered. Bake on 350 for 20 min or until cheese is bubbly and brown!